Islay is a place with a lot of history. 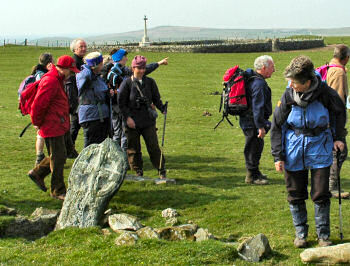 A great way to learn about it is to visit Islay and being shown and told about it. If that's not possible there's also a lot of information on the web: I've just discovered a site with a lot of old pictures, incl pictures from Islay and Jura. I plan to link to a number of them in a loose series over the coming weeks, where possible showing my own picture(s) and what I've heard about it. To start with the sanctuary crosses near Kilchoman on the west coast of Islay. We visited one of them during a walk from Kilchoman to Kilchiaran during WalkIslay 2005. The story behind the crosses is that if someone had committed a crime and made it into a triangle made up of three of those crosses, then he/ she was safe from prosecution (as long as they stayed within the triangle). A very similar story is told at Am Baile - Sanctuary Cross, near Kilchoman, Islay, together with an old picture of one of the crosses. While I can't be sure I think this might be the one near the crags behind Kilchoman House Cottages. Or the stones lying around it have changed. Either way, I'm wondering how much use this was to avoid prosecution? The area isn't that big and fairly exposed, apart from the church and may be a few houses which were there at the time. On what would a criminal survive if they made it into the ‘sanctuary’?